Contemporary plywood hulls can be elegant and refined. In order to attain the level of form and finish seen here, a builder must be careful in choosing stock. A great deal has changed in the world of plywood since those masters of the medium made the recommendations quoted above. The prospective plywood boatbuilder of 2017 wades into a thicket of unenforced standards, uneven quality, and outright flim-flammery. Lots of great choices remain, but you can’t simply judge marine plywood by its stamp. I started building boats in the 1980s. The exterior-grade AC fir plywood that Dynamite Payson advocated was already in precipitous decline. Even if you could find a panel not riddled with core voids, it would be warped like a potato chip. Modestly good underlayment-grade lauan plywood could still be had, but the paper-thin face veneers and crumbly core that distinguishes lauan today would be the norm by the early 1990s. Okoume was the stock in trade when I joined the nascent Chesapeake Light Craft in 1994. Strong for its weight and with a pleasing honey-colored grain figure, okoume is a heaven-sent choice for lightweight stitch-and-glue boats. As my purchases grew from a hundred sheets, to multiple pallets, and eventually to entire shipping containers of okoume, I sometimes found myself in the same spot as Patrick Mertaugh at Choptank Boatworks (see sidebar, “A Plywood Horror Story,”) I could specify internationally recognized standards for my marine plywood, such as the exalted “BS 1088” (see below), yet receive a shipment of plywood not fit for drawer bottoms. More about that in a moment. First let’s cover the basics of plywood. 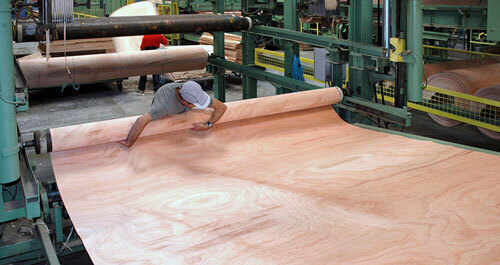 Most plywood is “rotary cut”—that is, it is made from long sheets of thin veneer peeled from straight logs. This veneer is sprayed with glue and stacked to form a panel, with each layer laid with the grain oriented 90 degrees to the previous one. Plywood quality varies depending upon its intended use, and builders should be well acquainted with grading standards. Nearly all marine plywood is made by peeling a giant continuous sheet of veneer off a spinning log, like tissue paper off a roll. Plywood made of such veneers is known as rotary-cut plywood. Plywood with “sliced” veneers has faces assembled from several narrower widths, cut like sliced cheese from one-half of a split log. “Ribbon-stripe” plywood uses such sliced veneers, although they’re narrower still, and taken from quarter-sawn logs. Sliced and ribbon-stripe panels are common in marine grades, but are used mainly for decorative joinery. Rotary-cut veneers are dried with great care to a moisture content of less than 8 percent. While much of the marine plywood used today originates in the forests of equatorial Africa, all of the veneer is dried elsewhere, mostly at mills around the perimeter of the Mediterranean. Equatorial Africa is damp, and plywood made there would warp the moment it arrived in a less humid climate. The veneers are sprayed with glue, stacked up with the grain of each layer at 90 degrees to the next, then squashed in a heated press for a few minutes. Thicker plywood takes longer to cure. If the glue dispenser hiccups or the plywood is hastened through the hot press, the veneers won’t bond properly and the stage is set for a delamination disaster. “Balancing” the sheets in the factory so that they don’t warp is tricky, so you should watch out for unstable panels. “Stability is the secret recipe of a plywood factory,” said Michael Geoffroy, of the French okoume specialists Joubert, and that’s about all he would tell me. It has to do with managing moisture content, veneer orientation, and veneer thickness. Plywood in which veneer species are mixed, or in which face veneers are too thin compared to the cores, are especially susceptible to warping. Gaps in the inner plies—so called “core voids”—are one of the qualities that separate good plywood from the mediocre stuff. At the end of the production line, the plywood is trimmed and stacked for shipping. Since the face veneers find their way to the plywood sheets in sequential order, it’s common to find a grain feature echoed right down through a pallet of a hundred sheets. Veneer quality is the primary difference between marine plywood and the stuff at the home center. The best imported marine panels will have face veneers without blemishes, patches, or seams in the veneer. Starting at 1⁄4″ (6mm) thickness, the imported varieties will have five veneers or more. 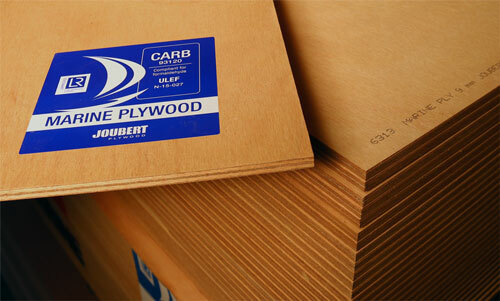 Average and better marine plywood will be free of core voids. 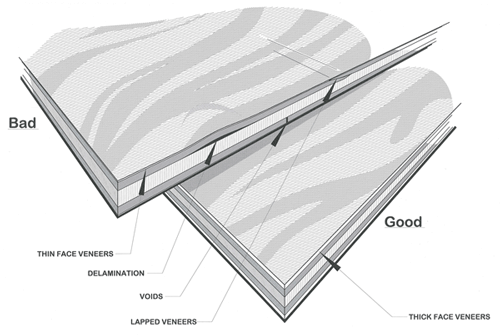 Watch out for overlaps of the core veneers, which create weak spots and cause an ugly crease in the surface veneer. Glue for marine plywood is a settled science. It will be either phenolic resin or melamine. In my experience both are equally durable. The phenolic glue is black and will show up more readily if you sand into it. The melamine glue is somewhere between clear and milky-white, and some builders prefer this for panels in which sanding might reveal the glue lines. Among the stamps you’ll see on marine plywood are the letters “WBP.” This stands for “water and boil proof,” resistance to boiling being the established standard for the strength of glues. To qualify as marine plywood, a panel must have no voids. It must also be assembled using a durable glue, and must pass rigorous testing for longevity. Once upon a time, it was common to order marine plywood in lengths greater than 8′. Some boats were even designed around 4′ × 12′ or 4′ × 16′ panels. Nowadays it’s unusual for suppliers to stock sheets larger than 4′ × 8′ (1.23 meters × 2.5 meters). Although 5′ × 10′ panels are common in Europe, I’ve yet to see any on these shores that were up to standard, or for which I was willing to pay the high shipping costs. A few suppliers will make up long panels to order, sparing you the trouble of sharpening your plane and cutting scarf joints. I once ordered some 4′ × 16′ plywood and received two 8-footers joined by an arrestingly ugly glued scarf. I wished I’d done it myself. Ask to see a sample of a scarf joint before emptying your wallet. It’s impossible to talk about marine plywood without a clear-eyed discussion of the classification system. As the sidebar on page 42 illustrates, the stamp on the plywood doesn’t always correlate with the advertised quality. BS 1088 is the coin of the realm, the sine qua non of plywood grades. The important thing to understand is that it is a voluntary standard. “There are no BS 1088 police” was a line I heard repeated by several different suppliers. 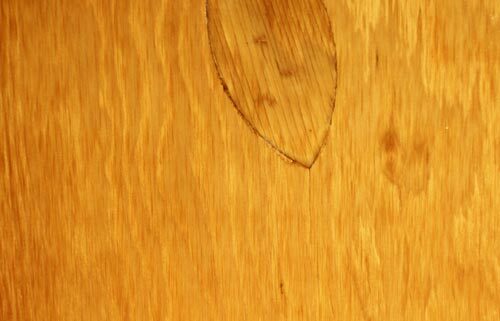 The BS 1088 specification applies to tropical hardwood plywood—that is to say, okoume, sapele, mer­anti, and a few others. It’s easier to list what BS 1088 allows than what it prohibits: “Sound pin knots,” as many as two per square foot on average; longitudinal joints in the face veneers every 20cm; variations in the advertised thickness—for example, 6mm plywood can range between 5.35mm and 6.04mm. It also allows “dutchmen” to fill gaps in the face veneers, which may be as thin as 0.5mm in 4mm plywood. Almost any one of those features would disqualify plywood from use in my shop, and it illustrates the variability of quality permitted under the standard. A lamentable amount of plywood no better than home center underlayment is advertised as BS 1088, with unflinching villains ready to sell the stuff to bargain-hunting boatbuilders. Plywood shoppers seeking some sort of safe harbor in the mayhem of the BS 1088 marketplace can look to Lloyd’s Register Group, Ltd. Lloyd’s Register is an organization that will, for a tidy fee, validate compliance with standards such as BS 1088. Marine plywood manufacturers who sign up for Lloyd’s Register Type Approval receive regular factory inspections, submit samples, and in general are expected to shoot straight. There isn’t a Lloyd’s agent standing on the assembly line with a clipboard, so bad stuff can slip through, but the bump in quality of BS 1088 panels with the Lloyd’s Register stamp is pronounced. Now officially retired, BS 6566 persists as a recognized standard for slightly lesser plywood. (For those keeping track, the new equivalent is BS EN 315.) While made of the same glue and tropical hardwoods, BS 6566 or BS EN 315 panels are described as “exterior” rather than “marine grade.” More blemishes in the face veneers, larger core voids (if filled), and mixing of species is permitted. Lloyd’s Register Type Approval is not available for 6566 and its equivalents. Purchased from the better mills, BS 6566 plywood is usually just as pretty as BS 1088. We use BS 6566 okoume selectively at Chesapeake Light Craft without issue. There’s good BS 6566 and lousy BS 1088. Some Lloyd’s Register marine panels will fail the most basic tests. Any charlatan can slap flimsy okoume face veneers onto Chinese poplar, have a stamp made, and call it BS 1088. So how do you find the good imported stuff? Research the reputation of the plywood mill and the supplier before you buy. The companies that have been around a long time have a track record of consistent quality. Douglas-fir marine plywood is strong and rot resistant, but due to its unstable grain is a poor choice for fine finishing unless sheathed in fiberglass. For heavier boats that won’t be varnished, marine-grade fir plywood continues to be a sound choice. It’s changed very little in 50 years, and the quality is uniformly good. As of this writing it remains the only widely available domestically grown marine-grade plywood. All veneers are Douglas-fir or western larch. It’s really heavy. While this was once open to some debate, in 2017 it almost goes without saying that marine fir plywood should be sealed in fiberglass or epoxy or both. The face veneers feature abrupt transitions between hard and soft grain, which makes a smooth surface difficult to achieve without a stabilizing coating of epoxy. Likewise, fir is notorious for “checking” as soon as you get it outdoors. Stick with the A-A variety, which means both face veneers are reasonably clear. Use fir marine plywood for heavy boats that need to be strong and rot-resistant, and don’t have a lot of tricky bends. And count on fiberglassing and painting the plywood. It ain’t pretty. Meranti plywood is a good, economical choice. It is heavier and stiffer than its closest competitor, okoume. In my experience MDO’s hard phenolic surface is bloody awful to sand, so its use should be restricted to sheathing jobs requiring a minimum of patching and fairing. It’s appropriate for interior bulkheads, engine boxes, cockpit soles, and so on. Several suppliers told me that MDO shouldn’t be used below the waterline because the relevant standards allow more core voids than marine plywood, but durable utility skiffs have in fact been built out of it. Meranti belongs to the family Dipterocarpaceae, lowland rainforest trees that are native to Southeast Asia. It’s a cousin to lauan. Excessive or illegal logging and the fact that some Dipterocarpaceae species are endangered has led big-box stores such as Home Depot and Lowes to limit its use in the United States. Relatively inexpensive in marine-grade spec, meranti appeals to amateur boatbuilders. Thinner panels, such as the 4mm thickness common in kayaks, tend to strain the BS 1088 standards if marked as such; I’ve never seen a single thin panel of meranti that I liked. Most meranti is a better fit with the BS 6566 stamp. 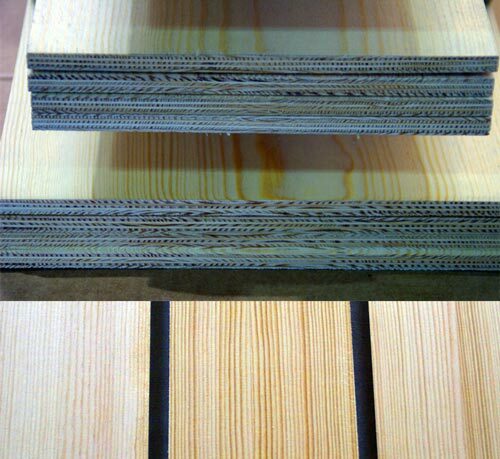 Thicker panels (9mm and up) have a more uniform quality, perhaps because the economics of thicker panels work better for the plywood mills. A thick panel and a thin panel both eat up the same two valuable face veneers, but the mill can charge a lot more for the thick panel. Meranti is denser and some 10 percent heavier than its competitor, okoume, and a little stronger. It has a dark color sometimes resembling walnut. I’ve had trouble with the grain of its face veneers tearing when cut. It requires a razor-sharp new cutting bit in the CNC machine at Chesapeake Light Craft. Okoume is the most common choice for small-boat construction: it is soft, flexible, and light. It’s not very durable, but judicious use of fiberglass and epoxy will take care of that. Aucoumea klaineana is an African hardwood found in the Congo Basin. It grows in close stands, the trees reaching a height of over 100′, the trunks thick and straight. In other words, it’s perfect for peeling into plywood veneers. Okoume is now so ubiquitous in small-boat construction that it scarcely needs introduction. The color ranges from blond to reddish-brown, sometimes within the width of a single face veneer. While classified as a hardwood, it’s soft, flexible, and very light. A cubic foot weighs just over 25 lbs. As the most popular of the tropical imports, okoume is available in a large variety of thicknesses, from 1.5mm up to 18mm. Durability is not okoume’s strong suit. Trapped water will turn okoume into mulch, and soon. Designers always specify an epoxy or fiberglass coating. Okoume and epoxy belong together like beer and pretzels. Using okoume as a core material in epoxy-composite assemblies results in wondrous feats of engineering: dinghies that weigh 80 lbs, kayaks that weigh 40 lbs, canoes that weigh 30 lbs. We’ve even cut airplane parts out of it. Okoume is the easiest to bend of the popular marine plywoods. Boats designed for it, especially of the stitch-and-glue variety, might be difficult to assemble if a stiffer material such as fir or meranti were substituted. Consult the designer before swapping species. Sapele is more expensive than both meranti and okoume, but its grain is more appealing. 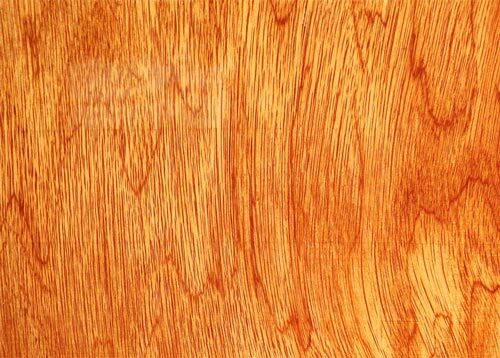 Sapele is a tall deciduous tree, a relative of African mahogany. Most of the sapele that finds its way to the United States is harvested in Cameroon. The veneer has a lovely fudge-ripple-swirl figure that most find irresistible under varnish. Sapele is denser, heavier, and stronger than okoume, making it an excellent choice for boats that have wide unsupported spans and don’t rely on fiberglass. The glued-lapstrake plywood boats of Iain Oughtred or John Brooks, for example, are an excellent fit for sapele. 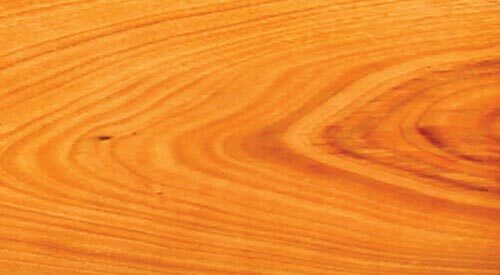 Like okoume, sapele is made into plywood at mills all over the world, and panel quality ranges from calamitous to surpassing. It’s expensive, so if you’re committed to using sapele, look for the Lloyd’s Register Type Approval. It’s worth a few more bucks. 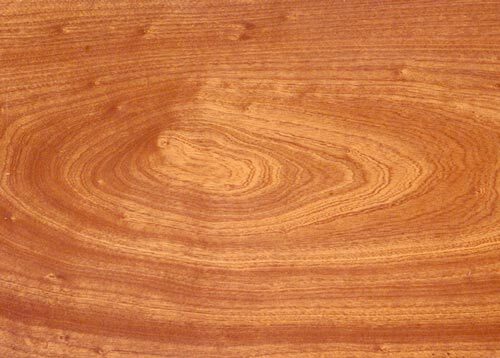 Khaya is the original “African mahogany.” Thirty years ago it was considered more or less interchangeable with okoume, but as the resource has dwindled it has all but vanished from the U.S. market. It’s available now only with sliced veneers, and rated for cabinet making. Vendia, a plywood made of Finnish pine, is the newest thing on the plywood market. It is strong and stable, like all plywood, but because it's made from sliced rather than peeled veneer it resembles solid wood. The pulling boat below is made of it. Not all marine plywood is imported from Africa and Southeast Asia. One example is Vendia of Finland, who offer an unusual sliced veneer plywood made of slow-growing Finnish pine (see review, WB No. 246). The result has the strength and stability of plywood but looks a lot more like solid timber. Glued-lapstrake boats built of Vendia Marine Plank are strikingly handsome with a clear finish. For now, Vendia is expensive and hard to get in the United States, and it comes in unusual sizes (16″ × 100″ is one option). Nevertheless, Vendia Marine Plank may point the way to the future of boatbuilding plywood: local species sliced into high-quality panels in small, artisanal batches. Right now, U.S. builders have a binary choice: domestic marine fir that’s heavy and must be painted, or imported plywood with a tropical provenance that makes some conservationists uneasy. How sustainable are okoume, sapele, and meranti? When I ask this difficult question I get passionate answers from all sides of the debate. The big mills insist that the resource is prudently and thoughtfully managed and offer as proof alphabet soups of official certifications, some of which cost millions of dollars to obtain. When I spoke to U.S. State Department officials with experience in equatorial Africa, they said that the European mills like Joubert were “doing it right” (their words) in terms of sustainability, though more work remains to ensure that citizens in places such as the Congo Basin share in the wealth generated by the industry. For devoted conservationists, logging in delicate ecosystems for profit is a curse upon the land and the people who dwell in it. Pulling boat made of Vendia plywood. As someone ethically involved in keeping wooden boatbuilding alive and accessible, I appreciate all sides of the argument. Here’s what I can tell you, based on my 20-year relationship with the French mill Joubert, Chesapeake Light Craft’s main supplier. Joubert’s plywood has the highest level of certification offered by the Forestry Stewardship Council. This includes stringent “chain of custody” rules that begin with each individual tree, the health of communities nearby, the welfare of workers, and so on up the line until the plywood arrives in the United States. Independent of the FSC chain of custody rating, Joubert also holds a PEFC (Programme for the Endorsement of Forest Certification) rating, a strict European standard for sustainability. Not all mills and not all species enjoy such protections, and plywood from good, certified outfits is a lot more expensive. A few minutes on the Internet will give you some idea of the quality, reliability, and sustainability of your chosen marine plywood source. As you research your options, take a moment to reflect: This stuff really does grow on trees. In 2010 Patrick Mertaugh, a professional boatbuilder, was commissioned to build a plywood powerboat to William Atkin’s Rescue Minor design. The construction was conventional and fastidious, the sort of clean job for which Patrick’s Choptank Boatworks has earned a solid reputation on the East Coast. Patrick is well familiar with marine plywood: before opening his own shop, he had worked through mountains of the stuff as a staff boatbuilder at my own firm, Chesapeake Light Craft. For strength and durability the 19' 6" Rescue Minor was planked with expensive 18mm sapele marine plywood over a male mold, then righted for decking and trim. The seams were sheathed in fiberglass and the entire boat was coated inside and out with epoxy. An Awlgrip primer and LPU paint finished the job. Resplendent in dark blue, the Rescue Minor slid into the Chesapeake and the delighted owner moved the boat to a lift on his dock. Within a week came big trouble. In spite of the boat’s impermeable epoxy coating, the veneer in the 12mm sapele plywood deck began lifting in the hot Maryland sun. Soon the bubbling had spread to the hull. With the delamination not confined to a single area or a particular sheet or thickness of plywood, the owner and the boat’s horrified builder grasped the grim truth: The entire shipment of plywood was faulty, and the damage beyond repair. The $75,000 boat was a total loss. The response of the importer who sold Patrick the plywood added to the dismay: their warranty, they vowed, extended only to refunding the cost of the plywood, and nothing more. Patrick was stuck with a lost winter’s work, or an upwind slog through the legal system, or both. “It was sapele,” Patrick said, “generally the best marine plywood money can buy.” The plywood was also stamped “BS 1088,” the code indicating conformity with the universally accepted British Standards Institute specifications for marine plywood. How did Patrick, a professional boatbuilder with lots of marine plywood experience, suffer such a spectacular swindle? I have on my desk as I write this a scrap of the plywood used to build the doomed Rescue Minor. It looks just fine! It has the characteristically redolent grain of sapele; there are no core voids and certainly no delamination; the face veneers are blemish-free, if a little thin, and it’s sapele all the way through. Speaking as someone who’s cut up more marine plywood than most, there’s nothing about that small sample to suggest fraud. The queasy reality is that if it can happen to him it can happen to me and you. 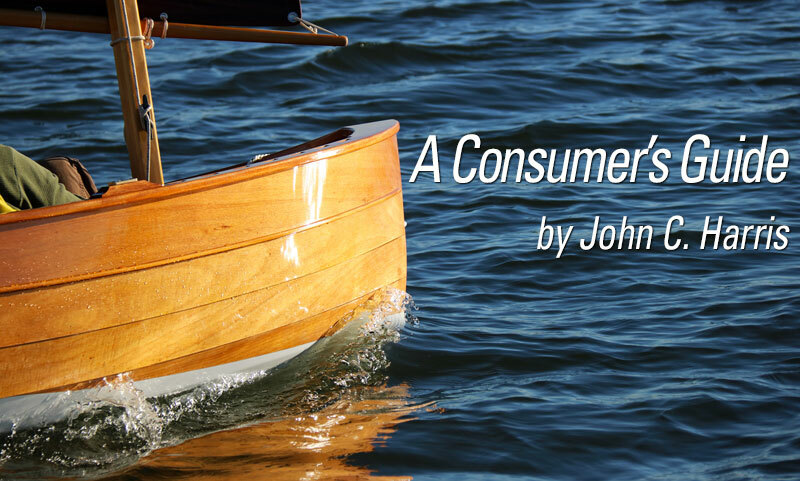 John C. Harris designs, builds, and writes about boats at Chesapeake Light Craft in Annapolis, Maryland.